I got a call from a breeder asking for my help. She had a litter of preemie puppies and only one was still alive. She had admitted that the pup had the best chance of survival with myself and my co-breeder and asked that we please help. We agreed and did everything we could to try and save this puppy. 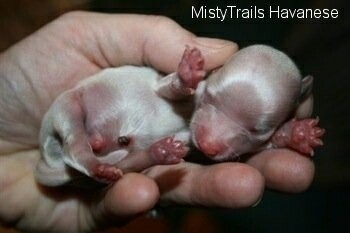 Preemie puppies rarely survive. In this case, the first two were stillborn and a third of the average birth weight. The next two puppies had come out and faded very fast. They were also both a third of the normal birth weight, approximately 2 oz. They were about the size of your thumb with very little hair. 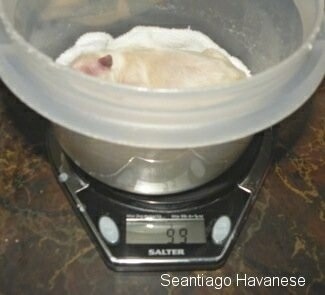 Then this little mouse was born at 85 grams (3 oz.). Average pups for this breed are 160 to 180 grams (6 to 7 oz.). We named him Mousey. My co-breeder and I were hopeful that we could likely save this puppy, so I flew over and picked up the preemie puppy and the dam. Preemie puppies are weak, chill easily, and usually do not know how to swallow as the sucking reflex is not ready. He would not nurse and needed to be tube fed (canine milk replacer and a little bit of glucose—Karo, honey or Nutri-Cal). Make sure you add in some of the dam's colostrum, retrieved by hand. A puppy needs 1 cc for every ounce of body weight every 2.5 to 4 hours. 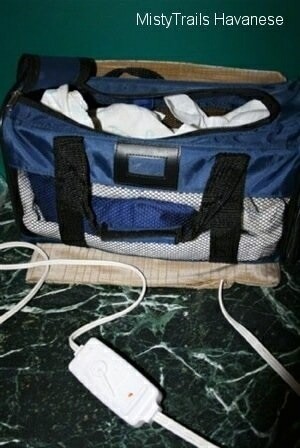 He also needed to be kept at approximately 95-100° F, much warmer than newborn puppies. But be careful not to burn him. He will need to be hydrated more because of the heat. It is OK to leave the preemie puppy in a warm box with the dam, but ONLY if she tucks him in close; otherwise he should be in a separate incubator box. 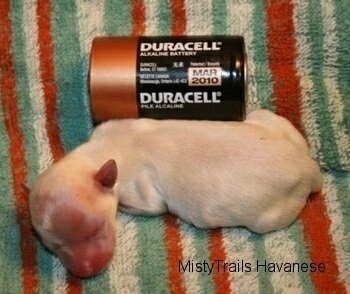 The reason you need to keep the puppy warmer is the puppy is supposed to be inside the dam for another week. The dam's temperature is 99° to 101° F. However, with the warmer temperature you risk the chance of dehydration. It is best to keep a puppy warm in an incubator, however if you do not have one you can also use other warm draft-free spots, such as a heating pad wrapped around a soft-sided crate. Inside are warm bean bags to hold in the heat. Taking care of a preemie puppy is a 24-hour job, feeding and pottying every two hours nonstop. Therefore my co-breeder and I were rotating our time with the puppy. On the third night the caregiver reports: Still hanging in there. Didn't look good at 3 a.m.; sounded like it was hard for him to breathe. I have been giving Nutri-Cal. He has been in a very warm box by himself. then back into his warm box. He seemed better at 5 a.m.
Day 1 he was 87 grams (3 oz.) and very dehydrated. Day 3 he was 107 grams. A very good scale that weighs to the gram, or to less than an ounce, is very important and a MUST. Unfortunately this story does not have a happy ending. Mousey did not make it. He had a bad night and died in my hands. 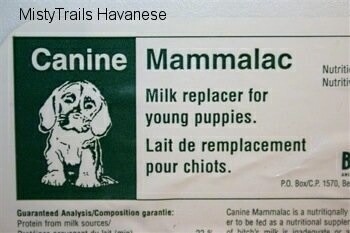 As breeders we do what we can to save the puppies. Sometimes things are beyond our and our vet's control. The vet feels this boy was 8 to 10 days preemie, and he had very low odds of survival. All you can do is throw everything at him, and hope for the best. The lungs were not developed. 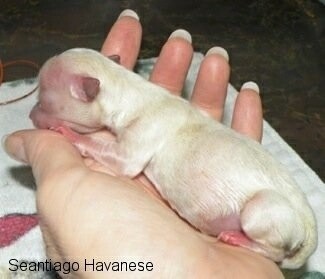 A pup up to five days early has a great chance at survival. A pup 5 to 7 days early needs TLC and has a good chance at survival. A pup 8 to 10 days early needs EVERYTHING done and more, and has a poor chance at survival. 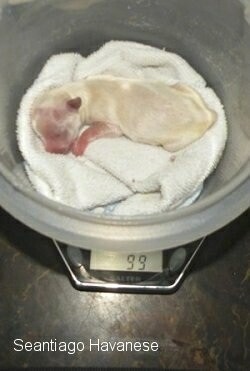 A pup over 10 days early will not survive. In another case a litter was born on day 52-54. There were 8 puppies born and only 5 survived. Sadly the mother of the puppies passed away during the whelp. The pups that were born a week early were not expected to survive, but with 3 weeks of around the clock care 5 of the puppies were saved.